Since its inception in 2007, The Hand Engravers Association of Great Britain is proud to have facilitated and supported a number of apprenticeships with leading engravers in the UK. This has enabled young, aspiring engravers to work alongside a skilled master craftsperson within their workshop. 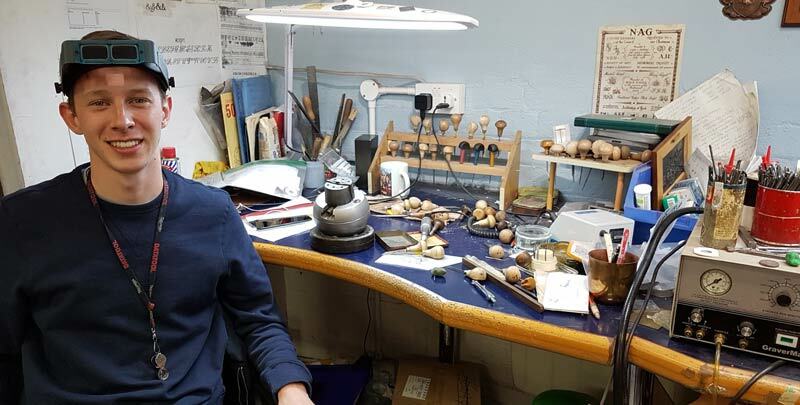 Matthew Hart is undertaking an apprenticeship at RH Wilkins/Rebus Signet Rings under Master Engraver Emmet Smith thanks to the generous support of Sir John Cass’s Foundation and The Goldsmiths Company. He is fast becoming a very talented hand engraver. Sarah Hobbs is now training full time under Master David Bedford at the engraving firm JJ Bergin, thanks to the support of the Queen Elizabeth Scholarship Trust, National Association of Jewellers Education Trust and the Friends of the Past Overseers Society of St Margaret and St John. Apprenticeships are an invaluable way for engravers to learn their trade. Sadly, opportunities are few and far between but the Association works to try and match potential apprentices with a master. Are you an employer looking for an apprentice? Or a business or organisation interested in supporting or funding an apprentice? For further details on either of the above, please get in touch with the Association’s Manager Sally Dodson at manager@handengravers.org.uk to find out how you can help.